When many life insurance websites tout that they offer instant life insurance quotes, what they really should say is, “We’ll have to call you to provide you with a quote” or “Life Insurance quotes in less than 10 minutes”. But for most, it’s anything but instantaneous. Many of them will trick you by luring you in, asking only one or two questions, and then in the next screen, you find you actually have to complete a lengthy questionnaire to see your not-so-instant quote. Here’s a novel idea. 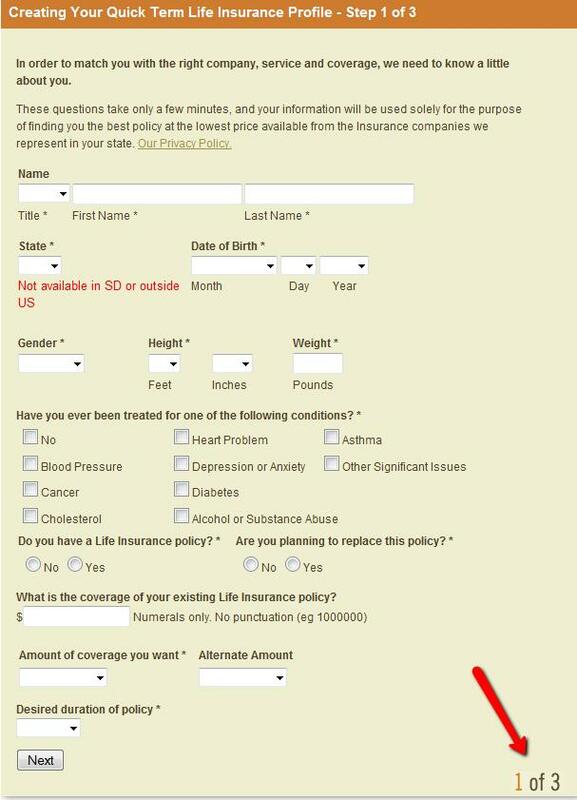 At Term Life Insurance for Males, just complete the form on the right, and on the next page, your quotes will show up. No games. Just quotes. Let’s analyze a couple of these sites and their quote request forms, starting with the one below. In this first example, we see the quote form used for a website where it first draws you in by asking for your zip code only. Then on the next page you come to this form where they not only ask for your phone number and email address (as do I), but also your home address, as well as your height and weight, and personal medical questions. But here’s the main difference between sites like this and mine. In many cases, you’ll spend 5 to 10 minutes answering questions for their questionnaire, and then when you submit your information, they don’t even show you the quotes. Instead, they tell you one of their representatives will be calling. The reason we offer truly instant life insurance quotes online using the form to the right is because we realize that some people just want to get an idea of what term life insurance or whole life will cost them without the hassle of telling an agency your entire life story. Then we either or call your ourselves to follow up, and be sure you have a good, accurate quote in front of you, or if we are not able, as you can read in our privacy statement, we will share your quote request details with a maximum of ONE affiliate insurance agency. All we want to do is help you purchase life insurance. We don’t want to be responsible for a dozen agents calling you… can you imagine anything worse? The other problem that pops out to me on this quote form is the disclaimer at the bottom, which states “I also agree to be contacted by phone and/or email by QuoteWhiz and its marketing partners, including Matrix Direct.” Use caution any time a life insurance quote form, or any other insurance form for that matter, tells you its marketing partners will be calling you. What could actually be happening is they could be selling your personal information to several life insurance agents, who will flood you with calls and fill up your voicemail and email inboxes for the next 3 months. Now, to be fair, we also understand, and so should you, that the quotes you’ll get using the form to the right may not be accurate if you do not quote yourself at the correct rating classification. So here’s a cheat sheet. If you’re in perfect health, don’t take any medications, and have no family history of disease, you can probably qualify for the best class, so go ahead and classify yourself as “Preferred Plus”. There are some other risk factors such as driving history, travels, occupation, and hobbies that could move you out of the Preferred Plus category, but again, we know you’re just trying to get an idea of the cost of term life insurance. If you take a medication or two for cholesterol or high blood pressure, you can probably still qualify for Preferred Plus with most companies, provided that no other health issues are present. If you have a bit more complicated health history, but nothing too serious, you might classify yourself at “Regular”. Again, this is just a ballpark, and your actual rating will need to be determined in a live conversation with one of our licensed representatives. Diabetes, sleep apnea, and individuals on pain medication would be a few people who might qualify at Regular or Standard Rates. If your medical history is even more complex, say with a history of cancer,obesity, or heart disease, you can still get yourself a quote at “regular”, but be advised that you may not be able to qualify for these rates. Your best bet is to call us at 877-996-9383 so we can find out exactly what we need to provide you with a comparison of life insurance quotes. Next, let’s review how instantaneous you’ll get your whole life insurance quote or term quote using our second competitor’s quote request form below. 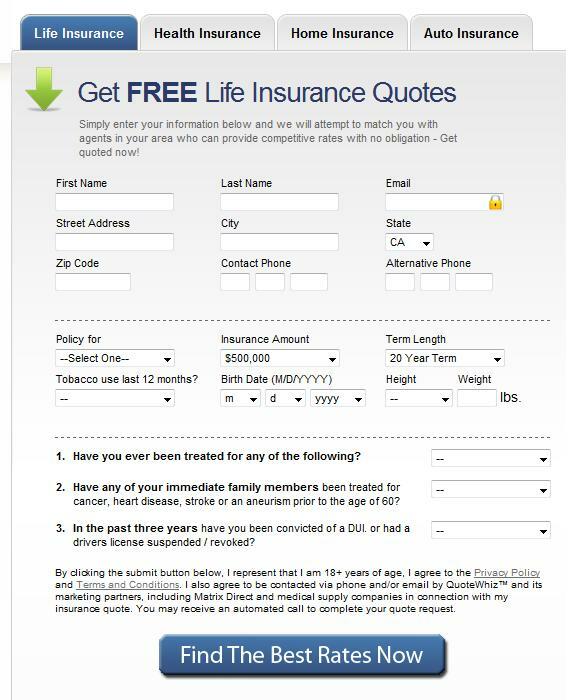 This is the form a very popular online life insurance agency uses, and it does not belong to Intelliquote or 1st Quote. What you don’t see here is that this website tells you on the entrance page for this “instant” quote to “fill out this simple online form and an expert will contact you with the best buys from the highly-rated companies” they represent. So it’s not clear when you complete this simple form whether you’ll actually even see the quotes you want, but it is clear you’ll be getting a phone call. This form is already asking for much more detail and personal health information than in the first example, and when you get done, you see at the bottom right that you’re only 1/3 of the way there. Enough with the games! If you want a truly simple solution, I 100% guarantee that if you use our quote request form on the right hand side of this page, on the very next page, you’ll have your instant life insurance quotes. No additional questions. No hassle. Or for more personalized help, call us at 877-996-9383.